Gifts, food, watching Ralphie nearly shoot his eye out in A Christmas Story are all important parts to making Christmas Day what it is. NBA basketball has become as much a Christmas Day tradition as curving those mass yule tide texts people send out every year. This year’s no different, and to get you in the NBA on Christmas Day spirit, we spoke to ESPN basketball analyst, Jalen Rose about today’s games, MVP’s and more. Which Christmas Day games are you most excited to see? That’s a terrific question. The one I’m most excited to see [pauses to think]… I’ll say Oklahoma City Thunder and the San Antonio Spurs, because we’ll get to see Russell Westbrook is playing like a top 5 player in the game. The Spurs re defending champs and are under appreciated, so I’m glad they get a prime time opponent on Christmas day. Jalen, you’re a pretty stylish guy. What are your thoughts on the Christmas Day Jerseys? I actually think they’re fly. I was not a fan of the ones with the nicknames. These are different with the fist names. I’ve come around a little bit on the shirts, but I’m glad I don’t play in this era because I got so used to playing without that shirts in college, I know I’d be uncomfortable out there. 2014 was a big year of emergence for some players, none more so than Anthony Davis to the Pelicans. He’s become a legit star in the league. Did you think he become an MVP caliber player so quickly? I joke all the time about the best players that are 6-foot-11, start out as 6-foot-1 point guards. They develop skills based on your size regardless of what level you’re on. He was a guard at first in high school and then grew. Now you see him doing guard things and he’s blocking shots and finishing around the rim. He reminds me a lot of David Robinson, I’m really a fan of his. Yeah, me too. He’d be in the conversation for MVP if the Pelicans make the playoffs. They’re not going to make the playoffs. [Both laugh] Not in the Western Conference. Well yeah, they probably won’t. But with how well the Warriors are playing, is Steph Curry the obvious MVP choice? He’s definitely in the conversation. I like how he’s developed his all around game. He could’ve went through the rest of his career just as a shooter, but he’s made a conscious effort to become a better player. Being around the league so long, I know how early it is. We’re not even at the All Star game yet. Things change so fast, it’s too early to talk about MVP’s. Let’s pick all stars first. 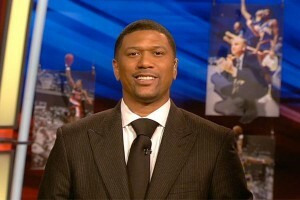 Jalen Rose story time is one of the best things about you being in the media. You love to tell stories about players and the things that went on in the league. What’s been the most awkward interaction after one of your stories? I’m fortunate that I’ve been doing this so long, I’ve built up equity with players. I don’t get those angry responses from players when I see them. I just try to say the truth and they know it’s not personal. You’ve definitely done that. But I was talking more about your funny stories about interactions from your playing days, like when you and Patrick Ewing almost got it poppin’ or the time Vince Carter slammed Sam Mitchell in the locker room. OK, Sam got mad about that [laughs]. He’s upset about that. He’d frown at first but he caught feelings behind it and I don’t lie, so it is what it is. Since your Fab 5 days, you’ve been an outspoken person who’s proved to be very socially aware and through your works with things like the Jalen Rose Leadership Academy, how’re active in the community. I’d be remiss if I didn’t ask you about your thoughts on what’s happening between the African-American community and the public backlash against Police brutality? I always prided myself on being socially and politically conscious. I follow the trends in my and other communities. It’s a humanitarian issue, but who it’s happening to makes it a racial issue. If you look at the stats, it’s those who are Black and Brown [experiencing police brutality] and thats what people are rallying about. I love to see [political awareness] in communities and sports, and its refreshing because I’m a firm believer in if you stand for nothing, you’ll fall for anything.